Joint HealthOlimp Arthroblock Forte - 60 kaps. 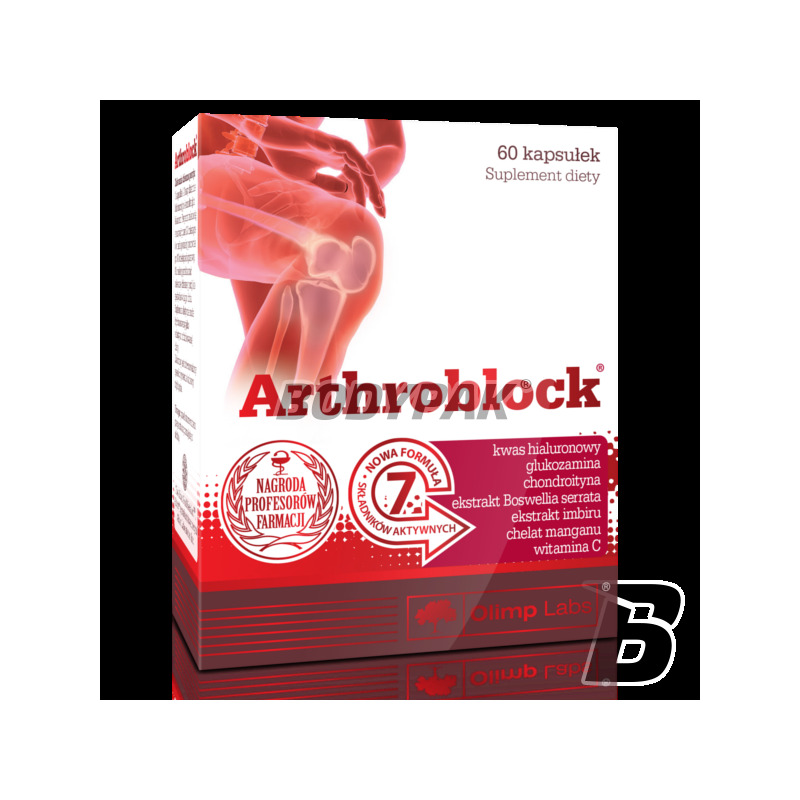 Arthroblock Forte is an innovative dietary supplement containing up to seven major active components in this innovative hyaluronic acid, having a positive impact on the protection, enhancement and regeneration of joints. Why the "teat" us in the joints? To connective tissue, which are built ponds could function without problems must be regenerated on a regular basis. The reasons for the weakening of the ability of reproductive tissues of the joints, ligaments, tendons and fascia can be gradual aging of the body or mechanical damage as a result of injury or accidents. With age, we lose the ability to reconstruct structures of the connective tissue, the main debtors damage are free radicals - active oxygen species, destructive acting on the body. In particular, the adverse effect of free radicals can be observed in the area of ​​the skin and motor apparatus, mainly composed of connective tissue which is particularly susceptible to the destructive action. With age, our natural ability to fight active oxygen species are weakening, which also leads to a progressive degeneration of the musculoskeletal system elements. At the same time it reduces the ability of the body for the synthesis of amino sugars, building blocks of connective tissue molecules. Therefore, it is advisable to supplement the diet primarily active antioxidants, such as vitamin C, also taking part in the synthesis of collagen - protein bonding tissue. Rich in antioxidants, particularly friendly joints, are plants such as ginger and incense used for centuries in China and India with a variety of dokuczliwościach camera movement. Do not forget about the already mentioned amino sugars. The beneficial effects of protection and supporting the musculoskeletal system are glucosamine sulfate and chondroitin sulfate. An innovative, even exclusive ingredient beneficial influence on our joints, tendons and skin, is so far known only from very expensive anti-wrinkle cosmetics and injections of hyaluronic acid. This amazing molecule can bind huge amounts of water, of course, that firms the skin, but also provides joints natural and soothing lubricant. What characteristics distinguish ARTHROBLOCK® FORTE other preparations for joints? 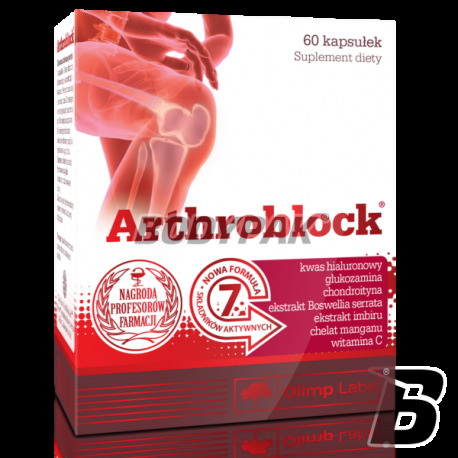 ARTHROBLOCK® FORTE is an innovative dietary supplement containing up to seven major active components in this innovative hyaluronic acid, having a positive impact on the protection, enhancement and regeneration of joints. The product is a supplement supplementing the diet with compounds necessary to protect, build and repair apparatus. It is recommended especially for people with injuries or ailments mechanical joints and the musculoskeletal system, auxiliary in the states of significant load of joints eg. During exercise or for obesity, and for the elderly. What differs ARTHROBLOCK® FORTE similar preparations on the market? Only complex preparation on the market, consisting of as many as seven active ingredients with high doses. It contains hyaluronic acid - an innovative ingredient used so far in very expensive injection preparations. All extracts contained in the preparation are standardized - that are specific amount of active compound that has appropriate physiological effect. The first preparation on the market which consists of manganese in the form of amino acid chelate ALBION (ALBION® MINERALS - guarantee the highest absorption and bioavailability of minerals). Substances contained in the preparation complement each other in action strengthening and regenerating parts of the camera movement. Recommended daily dose: 1 capsule 1-2 times daily or otherwise after consultation with your doctor. The formulation is recommended to use for 2-3 months, and if necessary again after 1-2 months break. Polecam, już po pierwszym tygodniu były efekty, teraz już mija 3 tydzień a ból jest nie odczuwalny. Kupiłam ten produkt dla mojego taty. Mówił, że jest z niego bardzo zadowolony i odczuwa poprawę. Swanson 5-LOXIN Boswellia Serrata Extract 125mg - 60 kaps. High quality health-promoting formulation based on an extract of Boswellia Sarrat, which is standardized to a content of 30% acetyl-11-keto-beta boswelliowego of (Akba)! It promotes health and quick regeneration of joints! This innovative supplement on the joints contains easily digestible hydrolyzed collagen and vit. C, aiding the regeneration of tissue. Effective doses of the active substances! Highly active, high-quality gelatine hydrolyzate tablets, which nourishes and renews cartilage and ligaments, joints protects the physical loads, especially during sports and overweight (no sugar!). Injuv is a non-invasive method to keep healthy and active joints. Comprehensive preparation for joints, composed of the find until 7000mg hydrolyzed collagen and a variety of additives such as MSM, glukoazaminę, omega 3, chondroitin, glucosamine and hyaluronic acid. It also contains vitamin C supplement strengthening the immune system and accelerating the synthesis of collagen proteins man! Each serving of this preparation actually supports the regeneration and health of the joints and movement system! The highest quality collagen protein hydrolyzate in the form of highly soluble powder. It strengthens the elasticity and tension of the skin and improves its firmness. Enjoy your taste and health!